Although I have never heard it said, I would be willing to bet that the term “old fogy” is not politically correct. 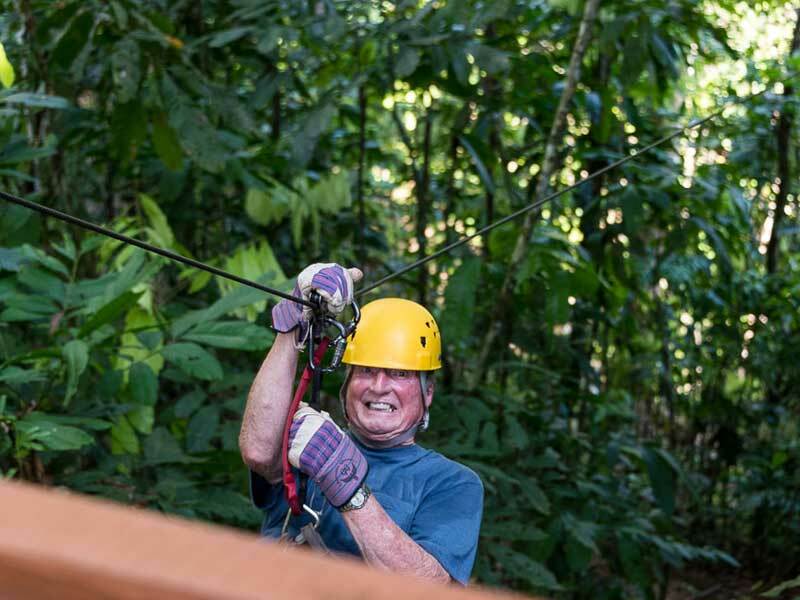 But since I consider myself to be a proud member of their ranks I will take the liberty of using the term freely when referring to all of us elderly folks doing crazy things in the rainforest canopy and having a great time. 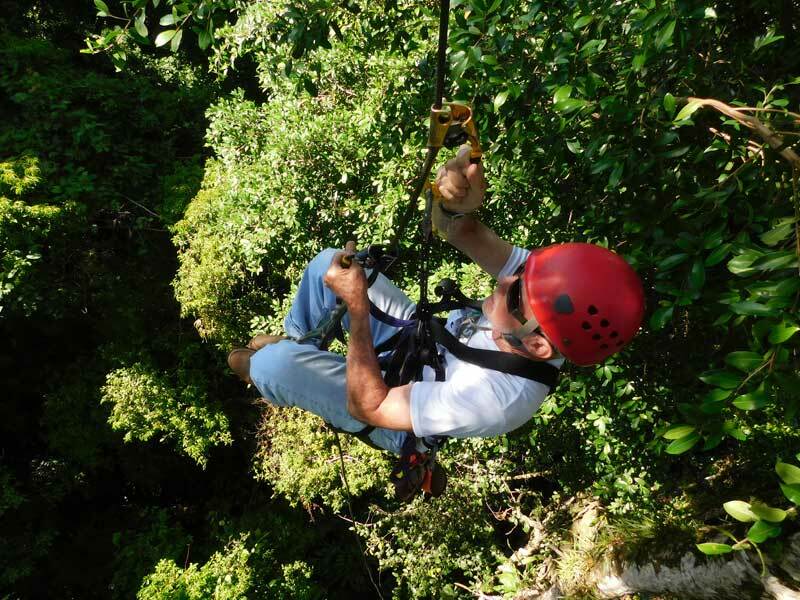 Here at Hacienda Barú our most popular tour is the Flight of the Toucan zip line tour. 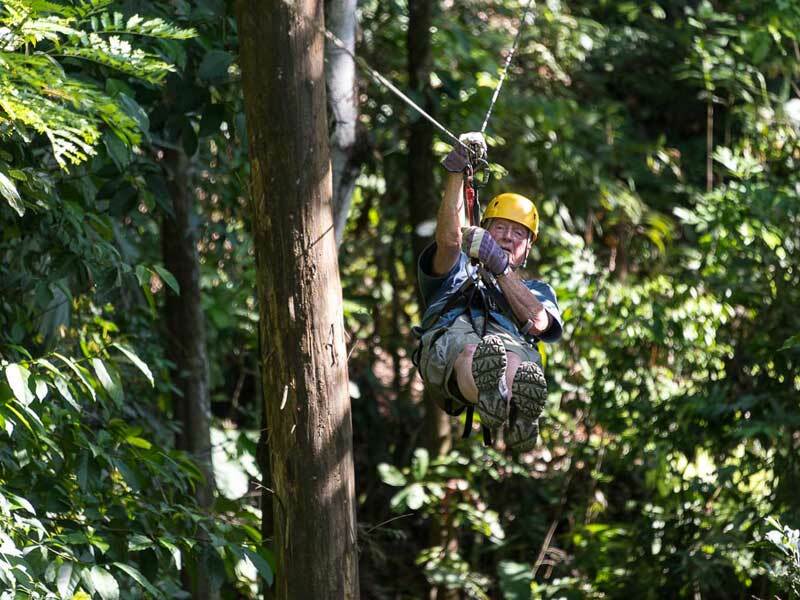 Unlike most zip line tours, the Flight of the Toucan is not an adrenalin tour. It’s lots of fun, and is thrilling, and visitors see wildlife and learn about the rainforest, but it probably won’t make you scream. It is not unusual for a family to come and do the tour, and the mother of perhaps 45 or 50 years will opt out. “Are you sure you don’t want to go?” I ask her. Occasionally I will talk her into it, but not very often. Actually, lots and lots of mothers and grandmothers and a few great grandmothers have done the Flight of the Toucan. The oldest person to have done it was an amazing lady named Jane who was 89 years of age at the time. It seems that a few months earlier at a family reunion some of the relatives had been talking about a zip line tour they had done recently. Looking at the photos Jane’s face lit up. “That’s what I want to do for my birthday this year,” she exclaimed. One thing led to another and her five sons brought her to Costa Rica for her 89th birthday. 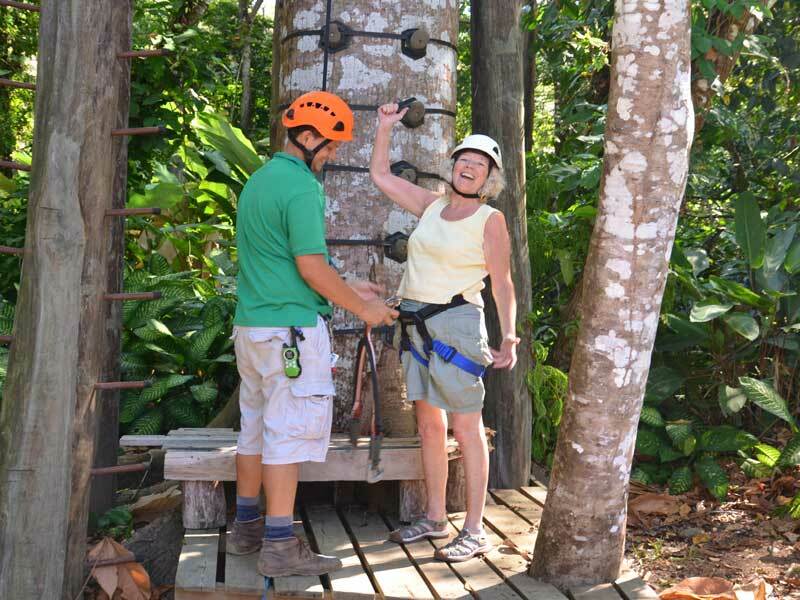 They all stayed at Hacienda Barú, and Jane became the oldest person to do the Flight of the Toucan zip line tour. Unfortunately, I don’t have any photos of her tour, but she loved every minute of it and was all smiles and totally exuberant when I talked with her later. I do have some wonderful photos of 82 year old Sam Nodland, the second oldest person to do the Flight of the Toucan. Sam went on the tour in March of 2018 with his photographer friend Brian Raub. As you can see from his ear to ear smile, he had a great time. Sally is the oldest person to have climbed a tree at Hacienda Barú. This is much more strenuous than the zip line. You actually scale a rope secured in the upper branches of an enormous rainforest tree more than 30 meters above the ground. Special equipment is needed, and the ascent is accomplished with techniques similar to those used by rock climbers. I guided this tour for 11 years and just assumed that I would always hold the record for being the oldest person to climb a tree at Hacienda Barú. I was 61 years old when I quit guiding it and 68 when I last held the record. Sally came to visit Hacienda Barú with her daughter and granddaughter in 2011. She did the zip line with her granddaughter whose mother made an excuse and opted out. Sally was amazingly spry and full of energy, and I just assumed that she was younger than I. “When we went on the zip line there was a big tree with the ropes up in it,” she said one day. “The guide told us that people climb those ropes all the way up into the top. I want to do that.” It was more of a demand than a request. “I’m not going to try it. I’m going to do it.” she shot back. “Sign me up. When can I go?” She was definitely peeved by my question. Carlos, an excellent tree climbing guide, was available, and they left about 30 minutes later. After they left I got to wondering. She appears to be about 65, but could she be older. Maybe she’s even older than me? “Let me see the liability waiver she filled out,” I told the receptionist who had signed Sally up for the tour. She handed me the waiver, and my eyes went straight to the age. The number “76” was written in the blank. My heart sank. A couple of hours later when they returned, I went and found Carlos. “Did Sally make it all the way to the top of the tree?” I asked, secretly hoping that she hadn’t made it, and that my record was still in tact. My record had been shattered. I had eight more years to go just to catch up to Sally’s record. I’m still working at it, and now have two more years to go to tie and three to reclaim my title. I climb the tree every year on my birthday. Near the end of 2016 we introduced the Monkey Challenge at Hacienda Barú. Imagine an obstacle course 10 meters above the ground. It consists of climbing a tree using climbing holds or a parrot scale. 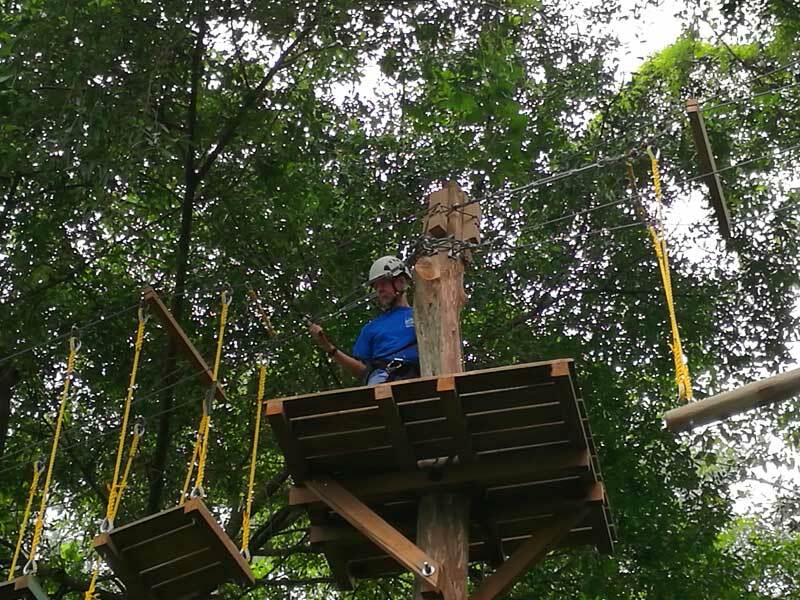 Then the participant must cross six rope bridges of varying difficulty, and finally jump off of a 10 meter platform while attached to an automatic belay device, that lets you down slowly. I was 73 when I did it and set the record, but I’m not taking any chances. This year when I turn 75 I’m going again. Just a few days ago a lovely lady named Billie and her husband Joe, an avid birder, came to Hacienda Barú for a few days. Billie is 70 years old and proud of it. She established the record for women and second place overall on the Monkey Challenge. When I asked her if she minded being referred to as an “old fogy” in the article she just laughed. 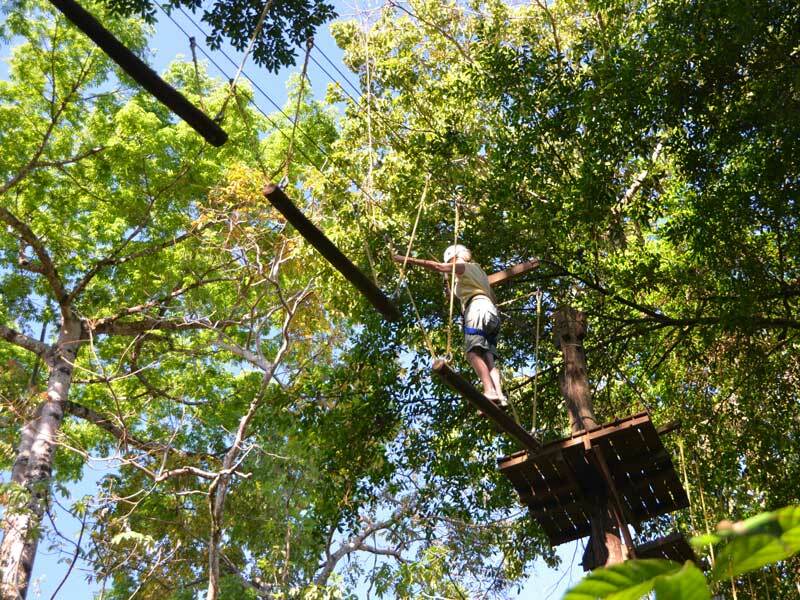 The reason I’m writing this is to honor all of us old fogies who have ventured into the tree tops at Hacienda Barú and hold us up as an example for all of those 50 year old parents who think they’re too old to do a canopy tour. Come on you guys. To us old fogies you’re just kids. Get out there and go for it. You might have some fun.